The club are offering Rovers supporters the chance to come and enjoy some fun on us when we face Scunthorpe United on May 3rd at the Keepmoat (12.15 KO). There will be plenty of family fun with music, penalty shoot outs, crazy golf, bungee runs, human table football, a clown a magician and much more, and you can be part of it ALL for as little as £10. 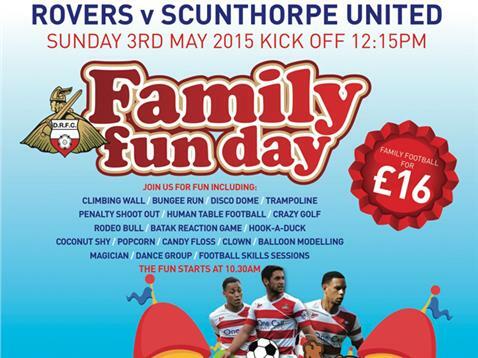 One adult and child can join in for just £16, which is great value for a day out as Rovers close the 2014/15 campaign.